Europe’s largest telco sold out Stateside, bought nearer home, and caught AT&T’s eye. Now the focus switches to fundamentals: upgrading networks, integrating businesses, and fighting for market share. This will be a slog. At least investors get a big dividend for their loyalty. 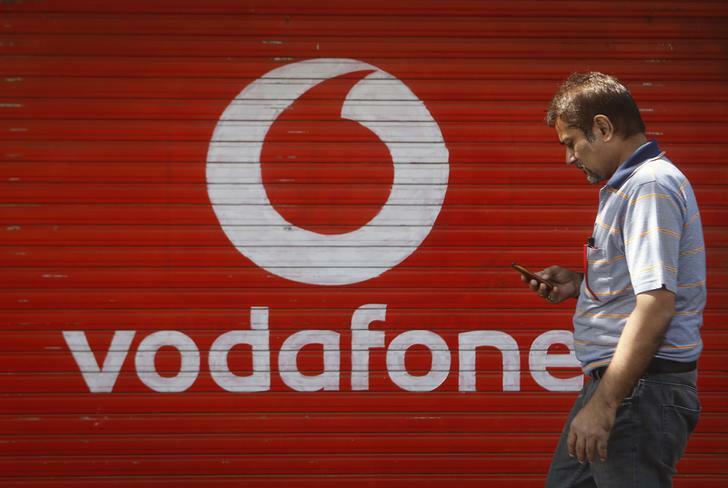 A man checks his mobile phone as he walks past a shop displaying the Vodafone logo on its shutter in Mumbai January 15, 2014. Vodafone, the London-listed telecommunications company, said revenue in the year ended March 31 fell 1.9 percent to 43.6 billion pounds. “Organic service revenue,” the group’s preferred measure, which includes items such as handset sales, declined 4.3 percent over the year. EBITDA fell 7.4 percent to 12.8 billion pounds. For the coming year, Vodafone forecast EBITDA of 11.4 to 11.9 billion pounds. By 0842 GMT on May 20, Vodafone shares had fallen 4.1 percent to 208.2 pence a share, the worst performer in the FTSE 100 index. Vodafone is the largest group by value in Europe’s Stoxx 600 index, according to Thomson Reuters Eikon, with a market capitalisation of $96.5 billion as of May 19’s close. “I am confident about the future of the business given the growth prospects in data, emerging markets, enterprise and unified communication,” Vodafone Chief Executive Vittorio Colao said in a statement.